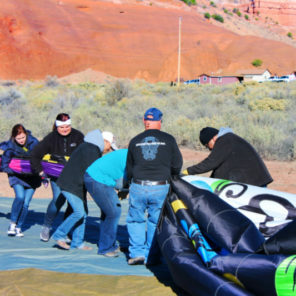 Why go hot air ballooning in Gallup, NM? 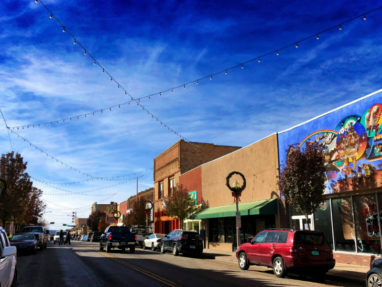 Gallup, New Mexico is located along the historic Route 66, which starts in Chicago and end at the Santa Monica Pier in California. Gallup was born out of westernization of New Mexico, situated between/among the many native tribes of the area. Today, Gallup is an ideal melting pot of Navajo, Hopi, Zuni and other native cultures living in peaceful co-existence with modern settlers. 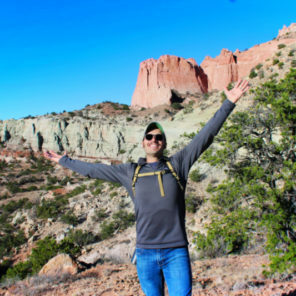 Living on a reservation ourselves, we know how the history and cultures can clash from time to time, but in Gallup, it’s all about the community, both native and non. They work together and celebrate each other’s history, skills, crafts and contribution to New Mexico society and tourism. 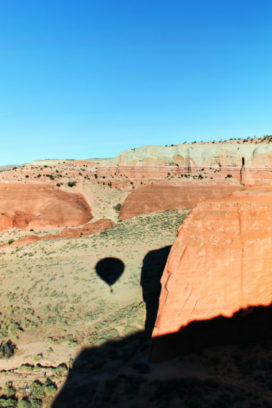 When it comes to hot air ballooning in Gallup, the scenery is the big reason to choose to do it here. 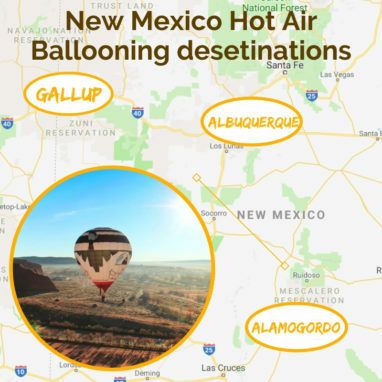 There are only a few hot air balloons based out of Gallup, New Mexico, so when you go up it’s unlikely that you’ll be surrounded by many others. 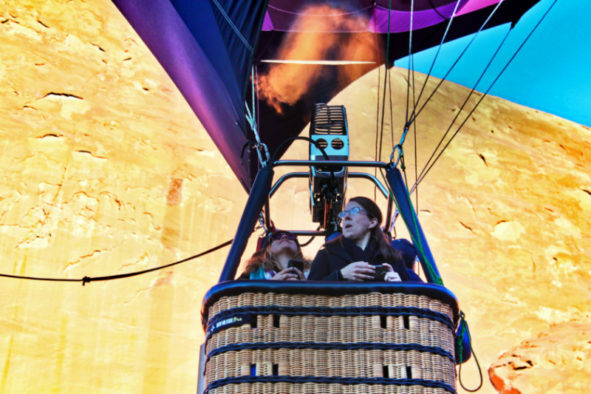 You’ll have a completely pure hot air balloon experience. 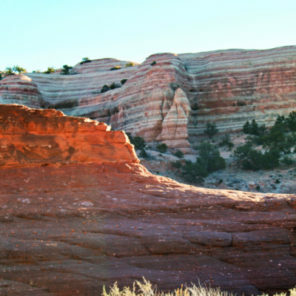 The landscape is one of a kind, found only here in Gallup and just outside of Radiator Springs. That’s right: the Red Rocks of Gallup are the inspiration for Carburetor Canyon in the Cars movies. It’s incredible to see in person. 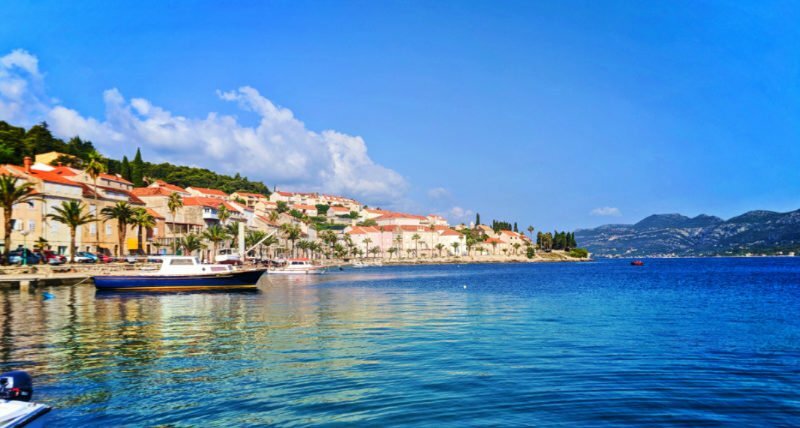 You don’t typically show up in a destination and book an epic adventure on the same day, do you? We don’t. We plan it, budget for it, and make sure that we’re well prepared for the actual experience. We recommend you do the same. 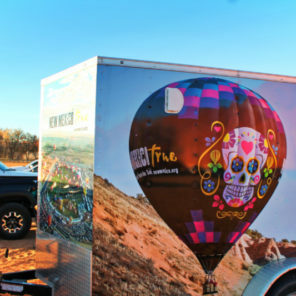 Hot air ballooning recommendation: X-treme-Lee Fun Balloon Adventures – I went up with them and it was awesome and so professional (and fun!). 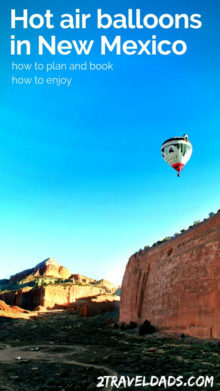 To book a hot air balloon adventure in advance in either Albuquerque or Taos, tour booking here. 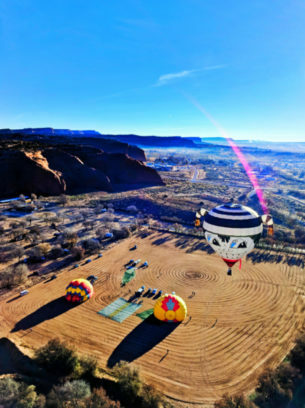 The reasons hot air ballooning is such a costly venture are due to the specialize equipment needed (balloons), rare skill sets (FAA certified pilots), fuel and more. As I said, this sort of experience is very unique and quite unforgettable from start to finish. 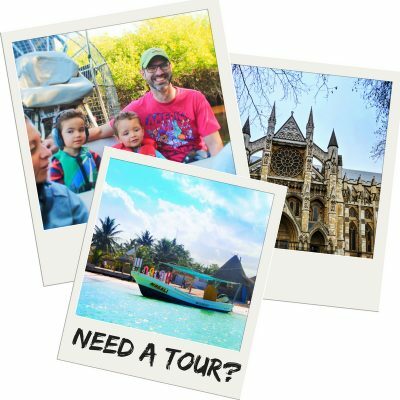 When the kids are a bit older and much taller (so they can see over the basket) we’ll be booking this as a family adventure, but for our kids being so young we will wait until they will for sure commit to going up AND they’ll remember it well. New Mexico is gorgeous and I’m pretty sure the sun is always shining. Having said that though, it’s also freezing cold when it’s perfectly clear, blue skies at 7am. Hot air ballooning requires cooler air temperatures, so you typically go out early in the morning or on a very cool evening. 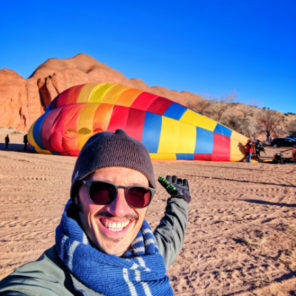 Like with most wonderful things in life, hot air ballooning in New Mexico (or anywhere) is a process. Taking an active role from start to finish is the best way to enjoy the full experience! Starting the day by helping the crew unfold the balloon you’ll be flying in is pretty cool. For me, watching the process of unpacking and setting up the basket, torch, and balloon helped me actually get over any fears I had about flying. 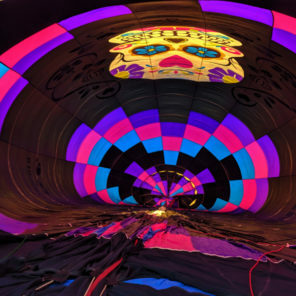 This is also a great time to hear stories, learn about the sport and culture of ballooning, and get to know your guides before you’re soaring above the desert with them. Once instructed, you’ll get into the basket of your balloon. Prior to getting in though, and as the balloon fills with hot air, you’ll probably be asked to hang onto the sides of the basket to keep the balloon from flying away. Once loaded, the crew will release the balloon on the pilot’s direction and away you go. It’s not a fast take off, but the thrill is real. Once in the air, relax and see where the wind will take you. Your balloon pilot will have been paying attention to the winds and changing weather before you even realized there was a slight breeze. Since hot air ballooning is largely dependent on the breeze to direct the travel path, you may have a very surprising experience. On my two flights we lifted off lightly each time, once floating up and staying open the open chaparral until landing, and the other time we rose very near the face of a cliff and contoured the canyon until the warm air took us up and over. It was quiet, there were jack rabbits bouncing all around below us, and it was unlike anything else I’ve done anywhere. 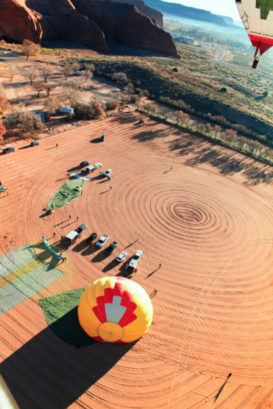 While it’s extremely rare that a hot air balloon will have a rough landing, it can happen if winds change or if there is some other emergency requiring a fast landing. Both of the landings I did were very mellow and soft… like, I didn’t realize that we’ve actually set fully on the ground. Really unforgettable experience. 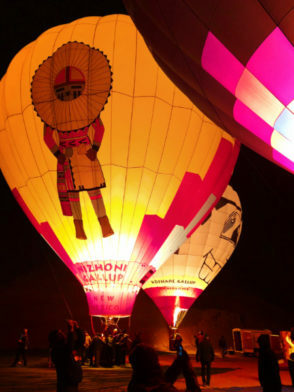 I had no idea what a balloon glow was until I arrived at the rodeo area in Gallup, New Mexico. There was a bonfire going with s’mores and such, and then there were a few hot air balloons set up, fully inflated in the dark. And then they cut the lights! Once the lights went out, the torches that drive the balloons are lit. 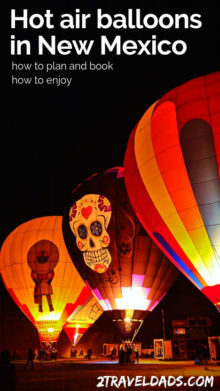 When they fire the torches, the balloons light up, glowing and looking incredibly beautiful. It’s a one-of-a-kind nightlife that I’d take over a bar or a loud concert any day. 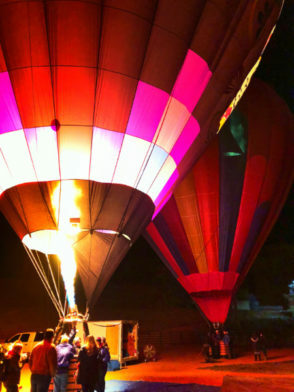 Tip: a balloon glow is typically done in conjunction with a ballooning event or festival, so review festival schedules to find and attend an after-dark balloon glow. 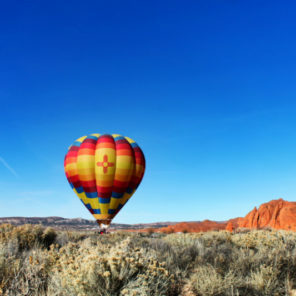 There are several well known events for hot air ballooning in New Mexico. 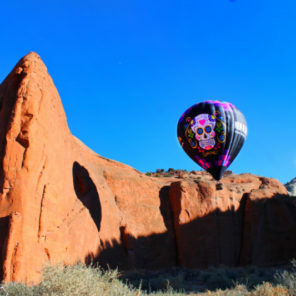 Starting in the north in Gallup, NM there is the Red Rock Balloon Rally at the end of each November. The number of balloons ranges from 150 to 200. 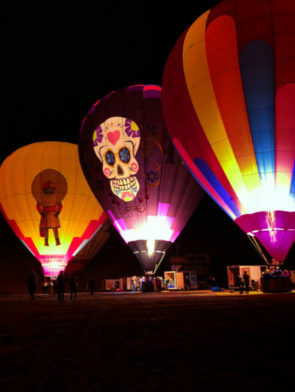 Santa Fe has several hot air balloon operators, but no large festival itself as it’s so close to Albuquerque. With a backdrop like Sante Fe and the mountains, why wouldn’t you want to check out options for having an unforgettable flight in the area. 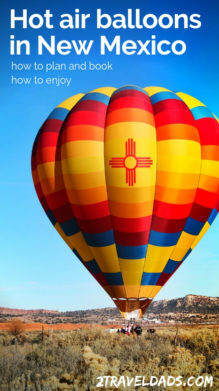 Albuquerque to the south is very well known for being a ballooning capitol in the world. With several different festivals and events through the year, you’ll find ample opportunity to take part of just observe. Lastly, to the south in Alamogordo, they get to do a very special hot air ballooning event: flying over White Sands National Monument. 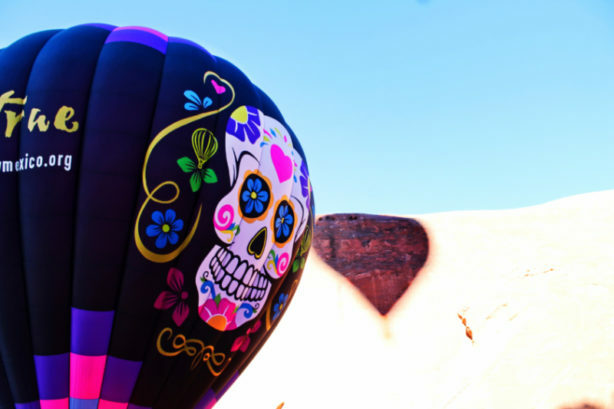 The only National Parks Service site to allow hot air balloons (and just for the September event), getting to be a part of this festival, the White Sands Balloon Invitational is a treat! Getting to do a hot air balloon is a very unique privilege. It’s a beautiful experience that very few people have the training and skill to lead. Hot air balloons are FAA certified aircraft and the process of flying in one should be treated with the same caution and respect as flying in a small plane. 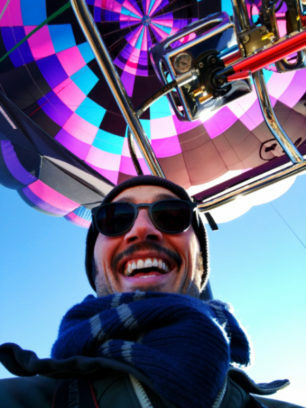 Photography in all stages of the hot air ballooning experience is encouraged, but from start to finish, you need to pay attention to the pilot. There are some amazing shots you can get, from your balloon shadow on a canyon wall to other balloon passing in front of the sun, but always we alert and attentive when around balloons, on the ground or in the air. Lastly, enjoy the experience and share it! 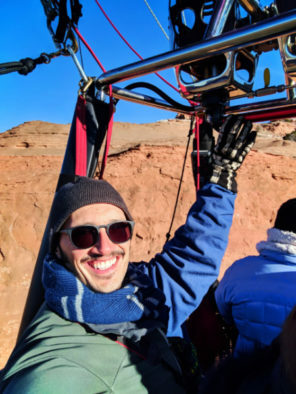 If you have the chance to go hot air ballooning in New Mexico or anywhere else, do it and bring friends along. 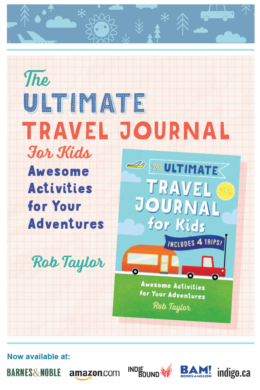 It’s a one-of-a-kind activity and you’ll be glad to share it with friends and family. 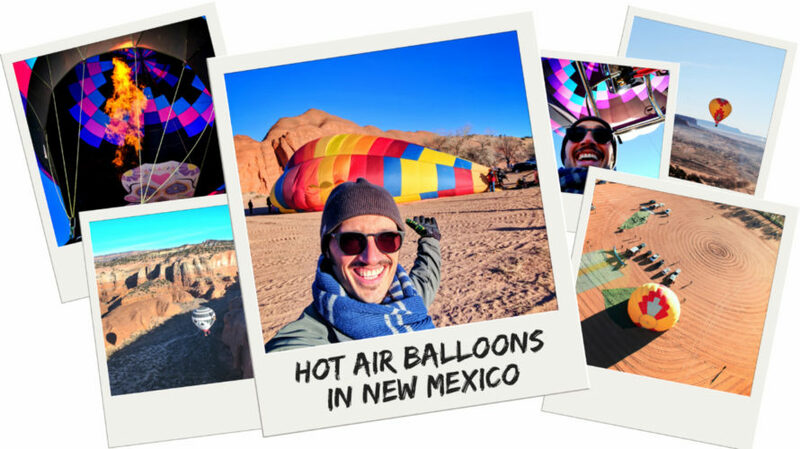 Want to pin this post for later when you’re planning and booking your own New Mexico hot air balloon experience? Go for it!!! 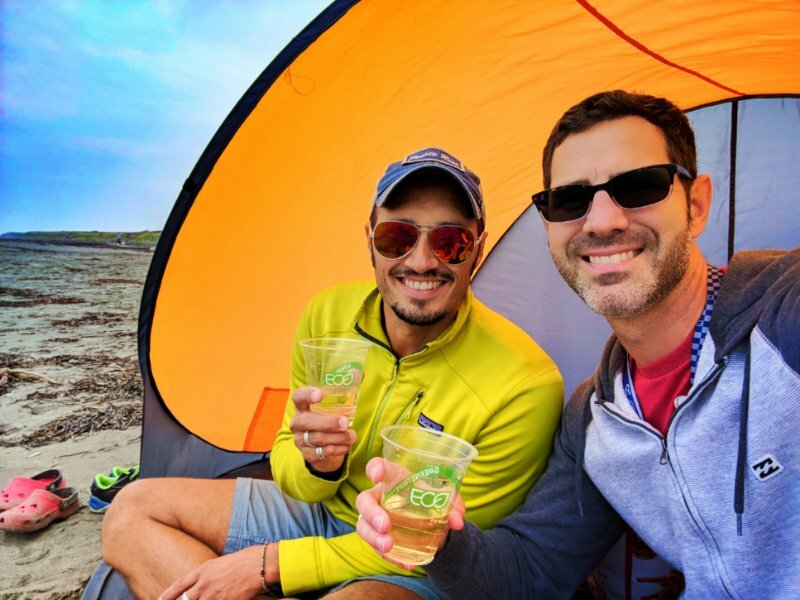 2TravelDads…You’re awesome. Thanks for flying with X-Treme-Lee Fun Balloon Adventures. Thank you so much for having me and being a part of our trip. 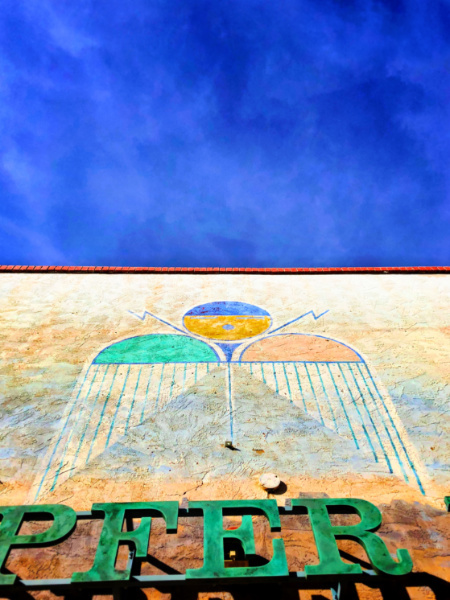 Really, you showed us all the most amazing side of the Southwest. This looks so fun! I’m a little scared of heights but I’d like to think I’d have the courage for this! It was such an awesome experience! New Mexico is very beautiful and truly enchanting. 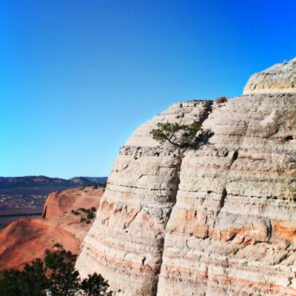 We passed Gallup many times and did not know that they have such thrilling adventures there. The pictures and video were very interesting to see. The landing was as soft as a feather. Native legends and a glass of champane from a guide was a very nice touch. Thank you for sharing your post. Great experience. 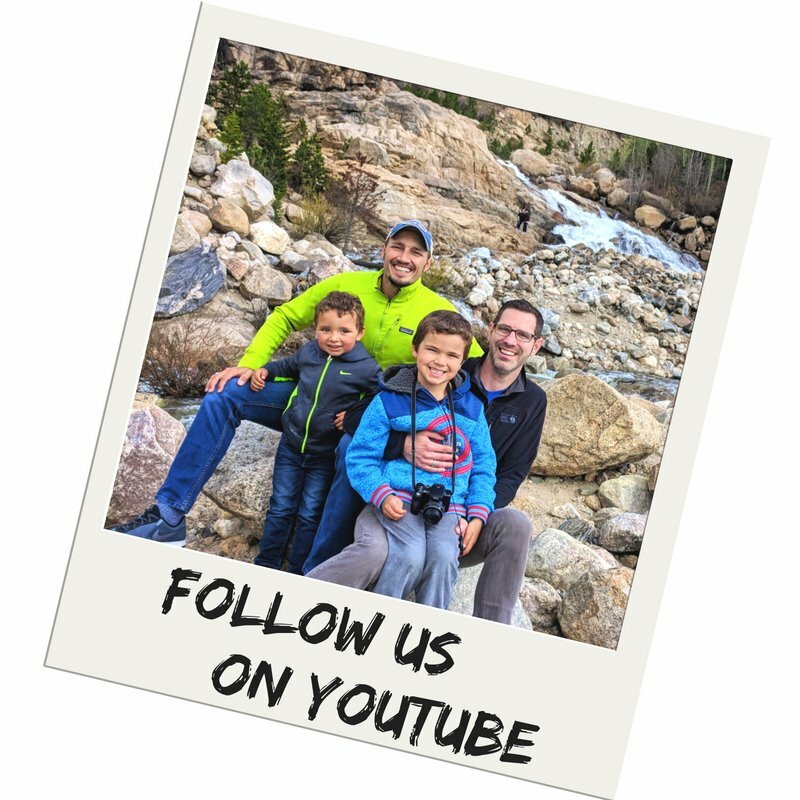 Loved watching the video but your descriptions of New Mexico and tips make me really want to do this – there! You’d love it. You’d, for sure, trip well here. The elevation did get to me a bit when hiking, but besides that, it was just incredible across the board. Let’s meet up in NM! !